Drs. Michael Humer and Barbara Campling are part of a thoracic oncology team that treats cancer patients via telemedicine. New UBC research shows that telemedicine dramatically improves access to quality medical care in small and rural BC communities—while saving time, money and travel risk for patients. The Interior Health Thoracic Surgery Group (IHTSG) of Drs. Shaun Deen, Michael Humer, Anand Jugnauth and Andrew Luoma represents a team of thoracic surgeons based at Kelowna General Hospital. Collectively, they serve a population of more than one million British Columbians dispersed across 807,000 square kilometres in the Interior and North regions of the province. About 80 per cent of IHTSG patients have cancer, most commonly in the lung or esophagus, according to Dr. Humer, lead author of the study and clinical assistant professor with the Southern Medical Program based at UBC Okanagan. 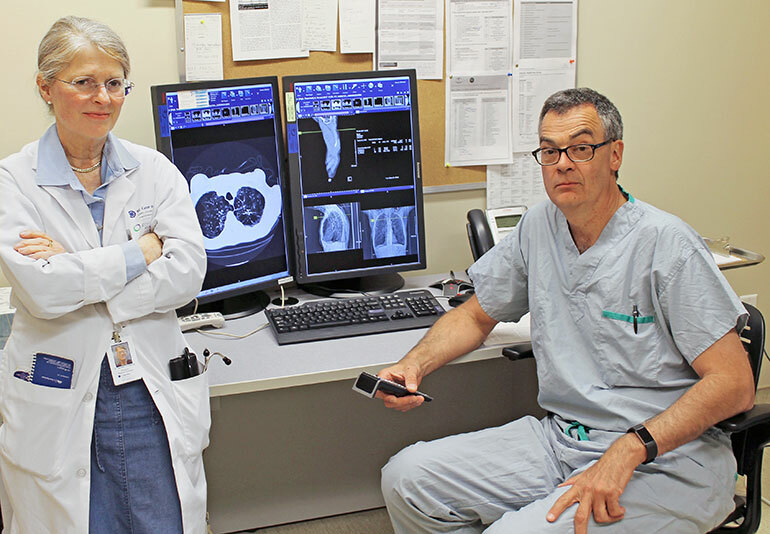 Through the use of a robust, secure Skype-like videoconference technology, Humer describes how thoracic surgeons provide patient-centred care to communities in the far reaches of the province. Between 2003 and 2015, the IHTSG conducted 15,073 telemedicine appointments from 63 different geographic locations. These same patients saved a total travel distance of 11.5 million kilometres, an average of 766 kilometres per patient. Telemedicine now represents 40 per cent of the Kelowna service’s practice, enabling surgeons to seamlessly provide consults and follow-ups with the few clicks of a button. Patients need only come to Kelowna if they require surgery. This greatly reduces the amount of travel time on BC’s mountainous highways, especially treacherous during the long winter months. Both Humer and Campling credit the commitment and support of Interior Health and the extensive collaboration with health professionals, office staff, and IT specialists across both health authorities in ensuring the timely and reliable delivery of the telemedicine service. The research was recently published in Current Oncology Reports.